Deepika Padukone's back problems have resurfaced while Irrfan Khan is down with severe jaundice. Fans were excited to know that two powerhouse of talents, Deepika Padukone and Irrfan Khan are going to feature again in a film together. The duo was roped in to star in Vishal Bhardwaj’s yet to be titled film. But citing Deepika’s back problem and Irrfan Khan’s health concerns, the filmmaker has postponed the shooting of his film. Deepika Padukone was recently spotted at Mumbai airport with a plaster on her back. It was being speculated that the Padmaavat actress might have injured herself while working out. But it turns out that the Sanjay Leela Bhansali film has given her an aching back. On the other hand, Iffran Khan is down with severe jaundice. Citing their health concerns, Vishal Bhardwaj has decided to push the shooting schedules of his upcoming film further. While Irrfan has been diagnosed with a severe case of jaundice, Deepika's back injury, which the actor suffered while filming "Padmaavat" has resurfaced, the director said in a Facebook post. "I am pushing back the film by a few months as both of my lead actors are down with different health problems. Irrfan is down with jaundice and it will take him a few weeks to recover and Deepika Padukone's back problem which had previously developed during the shooting of Padmaavat has now resurfaced. "Her role in the film is very physically demanding and the doctor has advised her not to do any strenuous work for a couple of months... I want both of them to be strong and fit before we start the film," Bhardwaj wrote. The director also clarified that the film is not based on underworld don Sapna Didi's life. He, however, asserted that her story was initially a reference point to the subject. 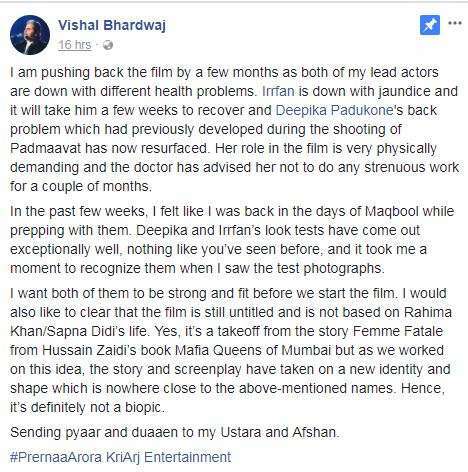 Image Source : FACEBOOK/VISHAL BHARDWAJVishal Bhardwaj postponed shooting for his upcoming film. Produced by Prernaa Arora's KriArj Entertainment, the movie is an adaptation of S Hussain Zaidi's book "Mafia Queens of Mumbai". "I would also like to clear that the film is still untitled and is not based on Rahima Khan/Sapna Didi's life. Yes, it's a takeoff from the story Femme Fatale from Hussain Zaidi's book 'Mafia Queens of Mumbai' but as we worked on this idea, the story and screenplay have taken on a new identity and shape which is nowhere close to the above-mentioned names. Hence, it's definitely not a biopic," Bhardwaj wrote. He added the look tests of the main leads have come out "exceptionally well". "In the past few weeks, I felt like I was back in the days 'Maqbool' while prepping with them. Deepika and Irrfan's look tests have come out exceptionally well." While this is Deepika's first film with Bhardwaj, Irrfan would reunite with the director for the fourth time, after "Maqbool", "7 Khoon Maaf" and "Haider". Deepika has previously worked with the actor in "Piku" which also starred megastar Amitabh Bachchan.